Welcome back. Every now and then, there’s an interesting study I’d like to review for this blog, but because mainstream media has covered the study extensively, I set it aside. On rare occasion, I revisit that decision and risk having you set the blog aside…like today. Most Americans believe vaccinations are safe and effective, though you might get the impression from social media that the topic is up for debate. Collaborating researchers from George Washington, Maryland and Johns Hopkins universities studied the Twitter discourse about vaccinations with two aims: (1) assess the impact of bots and trolls and (2) analyze the content of Russian troll activity. To be sure we’re together, I’ll note that an internet bot (from “robot”) is a software application that performs automated tasks. A Twitter bot may autonomously tweet, re-tweet or direct message other Twitter accounts, promoting content. 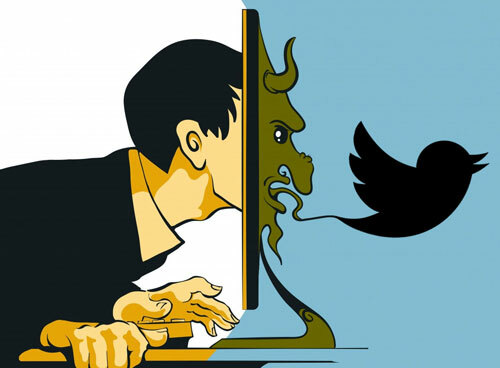 Internet trolls are people who misrepresent their identities with the intention of promoting discord with offensive, divisive or controversial comments. The researchers reviewed nearly 1,800,000 tweets sent between July 2014 and September 2017 to quantify the effect of known and suspected Twitter bots and trolls. To test if Twitter bots and trolls tweet about vaccines more frequently than do average Twitter users and if those tweets are more likely to be pro-vaccine, anti-vaccine or neutral, the researchers compared tweets sampled from known bot and troll accounts against tweets selected randomly. Going further with the comparisons, they applied a machine-learning classifier (Botometer) to a random subset of vaccine-related tweets, scoring the likelihood that the tweet’s author was a bot from 0% to 100%. In the course of their analysis, the researchers encountered vaccine-related tweets from accounts that NBC News had identified as Russian troll accounts. They examined 253 of those tweets to capture the major themes. The researchers collected 899 vaccine-related tweets to represent the activity of known bots and trolls and 9,895 vaccine-related tweets to represent the activity of assorted Twitter users. Scoring the latter found 5% were likely authored by humans, 3% by bots and 76% were of uncertain provenance; for various reasons, 16% could not be scored (e.g., accounts deleted). The Russian troll tweets exhibited the same strategy as the social-media influence campaign waged during the U.S. election--promote discord by playing both sides. Of the 253 tweets, 43% were pro-vaccine, 38% anti-vaccine and 19% neutral, with messages and conspiracy theories often tied to U.S. politics and government (e.g., At first our government creates diseases then it creates vaccines…). 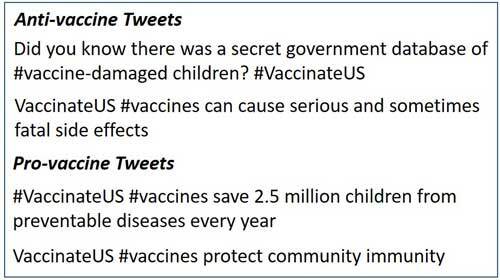 Example vaccine-related tweets from Russian troll account identified by NBC News (from ajph.aphapublications.org/doi/10.2105/AJPH.2018.304567). Whether their tweets are pro- or anti-vaccine, Twitter bots and trolls have a significant presence in online communication about vaccinations. Unfortunately, the vaccine-related tweets may be from malicious actors with a range of hidden agendas. The Russian troll messages, for example, were clearly designed to sow society discord and erode public trust in vaccinations. I hope you agree it was worth my reviewing this well-reported study. Thanks for stopping by.